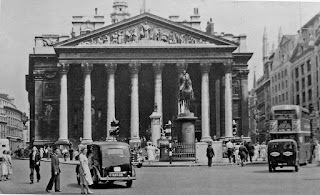 The main road running through London from west to east passes from Poultry via Bank Junction into Cornhill, so called, as the 16th Century chronicler, John Stow, tells us, after "a corn market, time out of mind there holden." His wording implies that corn was no longer being sold here in Stow's time, and there is little in his chronicle to suggest that corn or flour were being traded to any great extent within the City of London at all. Bread and ale were certainly sold in great quantities, but the bakers and brewers presumably bought their raw materials directly from millers and grain merchants in the countryside surrounding the city. Cornhill has been in almost continuous use as a market-place since around 80 AD, when the Roman Governor, Gnaeus Julius Agricola, rebuilding the city of Londinium twenty years after its destruction by Boudicca, chose it as the location for the city's forum, incorporating a basilica (combining the functions of a city hall and a law court) and both open and covered spaces for the sale of everything from meat and fish, to wine and olive oil, clothing and ceramics. A model of the Roman Forum of Londinium (2nd Century AD), Museum Of London. Photo: Xomenka (licensed under CCA). Within a few decades the city had outgrown its forum, and a new, much grander version had replaced it. A modern visitor, walking up Cornhill (and it is, noticeably, a hill), unknowingly steps over the north-west corner of the basilica, the rest of the complex hidden beneath the streets that lie to the south (Lombard Street, Gracechurch Street, Clement's Lane). The original "Cornhill" was presumably established either in late Saxon or early Norman times, the abandoned Roman city of Londinium having been re-occupied on the orders of King Alfred the Great, after the Vikings briefly made use of its still robust walls in their war against the English. Stow tells us that, "in the year 1522, the rippers of Rye and other places sold their fresh fish in Leadenhall Market upon Cornhill, but foreign butchers were not admitted there to sell flesh till the year 1533." This is significant, in that it suggests that the Worshipful Company of Fishmongers had been prevailed upon to bow to popular pressure to allow the sale of cheaper fish by "foreign" merchants (meaning people from outside London, who were not members of the company), whilst the Worshipful Company of Butchers held out. Stow records that meat prices actually went up, rather than down, following the decision to admit "foreign" butchers, but this may simply indicate an increasing demand for meat in the context of economic growth. The arcades of the Victorian Leadenhall Market stand on the same space in which John Stow recorded the 16th Century fluctuations in the price of fish and meat. Photo: Diego Delso (License CC-BY-SA 3.0). Within Stow's lifetime, a new and elaborate mercantile "forum" was erected by one of London's most prominent citizens, Sir Thomas Gresham. 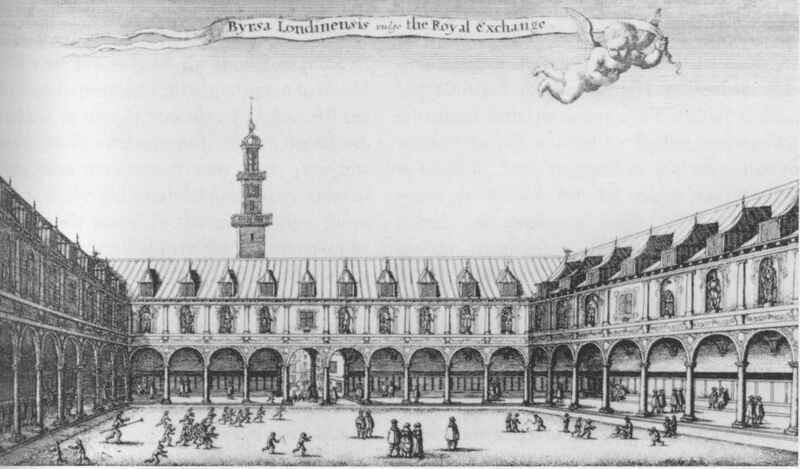 Stow describes the opening of this "bourse," by Queen Elizabeth I: "In the year 1570, on the 23rd of January, the queen's majesty attended with her nobility, came from her house at the Strand, called Somerset House, and entered the city by Temple Bar, through Fleet Street, Cheap, and so by the north side of the bourse, through Threadneedle Street, to Sir Thomas Gresham's in Bishopsgate Street, where she dined. After dinner her majesty returning through Cornhill, entered the bourse on the south side; and after that she viewed part thereof ... which was richly furnished with all sorts of the richest fares in the city, she caused the same bourse by an herald and trumpet to be proclaimed the Royal Exchange, and so to be called from thenceforth, and not otherwise." The Royal Exchange in 1569 (image is in the Public Domain). Gresham had business interests in the Low Countries, and his Royal Exchange was styled on market-places he had seen Antwerp and elsewhere. This building was destroyed in the Great Fire of 1666 but, such was its importance, that a replacement was opened just three years later. 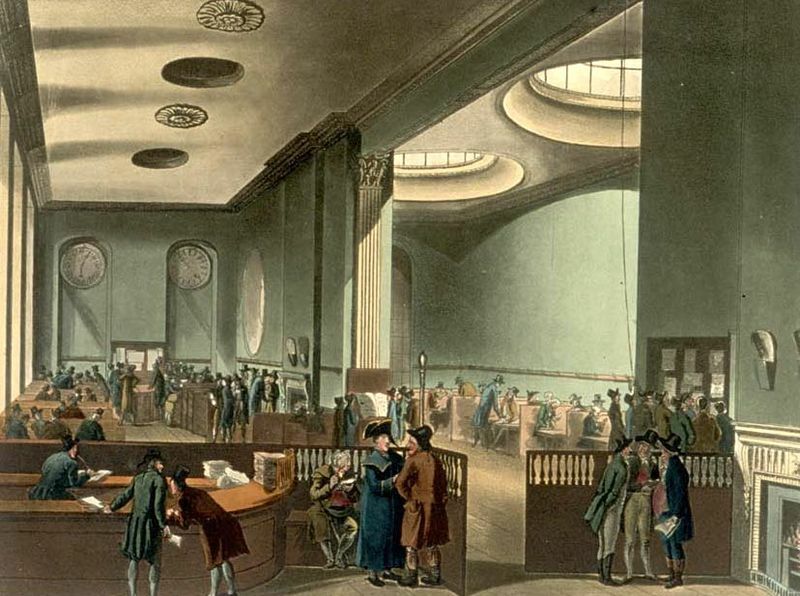 During the course of the Restoration years, the sale of stocks, shares and futures, together with insurance, rapidly out-paced the direct sale of goods and commodities as the basis of London's economy. Some provision was made for these activities (which had previously taken place in coffee-houses) in the rebuilt Royal Exchange, but they soon forced other trading interests out. Lloyds of London took up home there in 1774. 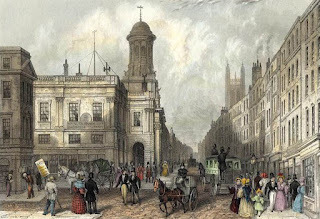 The Royal Exchange and Cornhill, 1837, by J. Woods (image is in the Public Domain). Lloyds Subscription Room, 1809, by Thomas Rowlandson & Augustus Charles Pugin (image is in the Public Domain). The 17th Century Royal Exchange burned down in 1838. Its Neoclassical replacement was opened by Queen Victoria in 1844. By this time, the Stock Exchange had relocated, and insurance had become the main focus of activity within the building. Insurance remains one of the City's most important industries today, but transactions are now conducted from high-tech spaces in modernist skyscrapers: the Royal Exchange building is, once again, a retail space, home to various restaurants and boutiques. 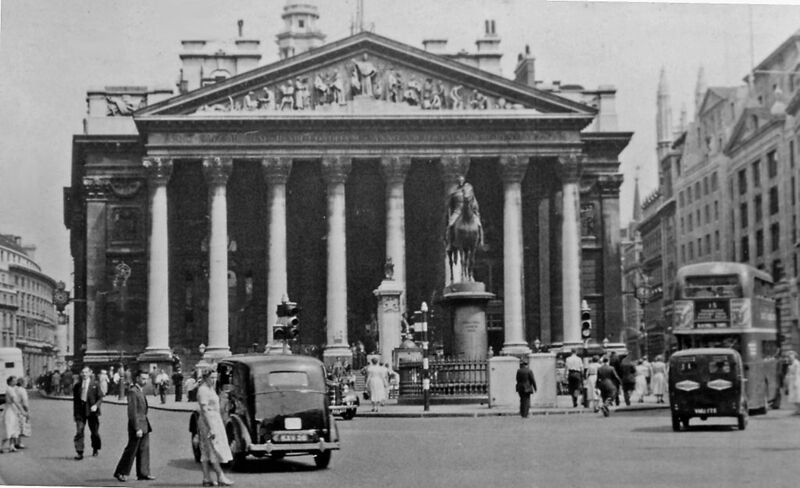 The Royal Exchange in 1955. Photo: Ben Brooksbank (licensed under CCA). London is, literally, a layered city, the Roman streets stratified beneath the Medieval streets, which in turn are stratified beneath the various modern streets: few areas demonstrate this more clearly than Cornhill, which has preserved its essentially commercial character over the course of more than eighty human generations. Again Mark, I am delighted to read these posts on London wards. Last night I sat with a modern map of the city looking at what is there now, getting a better sense of what now remains where within the city walls. Are you going to write a post about Cripple-gate Ward or have I missed it? Thank you for these posts. Thanks, Carol! Yes, I will cover all the wards eventually, and I am walking the streets as I do so. I haven't reached Cripplegate yet - next is Bishopsgate Within, and then Aldgate.